The strictest-ever annual fishing ban in China started to take effect from Monday nationwide, a move to preserve marine environment as the country's coast depletes. Experts said the moratorium will also contribute to environmental sustainability. The ban covers the Bohai Sea, the Yellow Sea, the East China Sea, and the waters with latitude 12 degrees north of the South China Sea, and requires halt in all types of fishing work including fishing aids starting 12 am on Monday, according to the Ministry of Agriculture, which adjusted the fishing order in January. For some areas, the ban will be lifted on September 1, and for others on September 16, the ministry noted. Some coastal provinces have ordered local fishing boats to stop working, and this year's extended summer fishing moratorium is the strictest ever in some places, media reported on Monday. 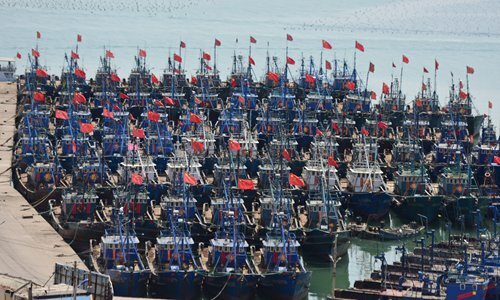 For example, the number of boats affected by the ban in Xiamen, a coastal city in East China's Fujian Province, has reached 1,048 this year, local news site taihainet.com reported on Monday. The current ban has extended the moratorium by half a month, with authorities tightening patrols to prevent illegal fishing, according to the report. In Qingdao, a coastal city in East China's Shandong Province, 5,000 boats have been grounded and 730 kilometers of coastline is brought under surveillance, domestic news site ql1d.com reported on Thursday. The South China Sea fishing moratorium will affect a total of 66,000 fishermen with 18,125 boats, domestic news site chinanews.com reported on Monday. "As far as we know, the fishery authorities have started working today, though it's a national holiday," Chang Yaqing, director of the College of Fisheries and Life Science of Dalian Ocean University, told the Global Times on Monday. The move is aimed at improving the marine environment sustainability and helping ecological restoration, Chang noted. The new regulation came after the authorities noticed a decline in the fishery output in recent years due to deteriorating environment, an industry insider surnamed Zhang told the Global Times on Monday. Though the industry output reached 1.13 trillion yuan ($163.83 billion) at the end of China's 12th Five-Year Plan (2011-15), the industry is faced with challenges such as unbalanced and unsustainable development, according to a post published on the website of the China Fisheries Association in January. By 2020, the industry needs to be further upgraded and diversified, for instance, by introducing more sectors including fish breeding and processing while controlling the total output target for the coming years within 66 million tons. "Overall, we're facing overcapacity in the fishery sector, and the new ban will definitely help ease this problem," Zhang said. An extended summer fishing moratorium will benefit fish breeding, which is likely to produce a better stock in September than the previous years, said Ma Wenfeng, a senior analyst at Beijing Orient Agribusiness Consultant. Ma told the Global Times on Monday that the longer fishing ban would not push the prices of seafood up as the consumption largely relies on seasonal factors. But Ma expressed concerns that the fishing ban extension could increase domestic unemployment. Some other fishing-related industries are expected to be developed including seafood processing, aquaculture and marine tourism, aiming to create more jobs for Chinese fishermen to prevent them from overfishing in domestic waters and sailing into distant waters, according to Ma. "Such steps will be of great help in alleviating the problem of fishing in distant waters," he said. Fishing in distant waters, which has raised concerns in foreign countries as far away as Africa, has been attracting more attention of Chinese authorities, Zhang noted. "The government, along with industry representatives, has been in constant touch with their counterparts overseas on this matter," he said, adding that both sides have to follow rules and regulations.